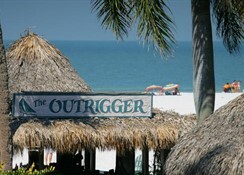 The Outrigger Beach Resort rests on the shell-laden, sugary sand of Fort Myers Beach along tranquil waters of the Gulf of Mexico.With a wide range of accommodation choices nestled in a playground of lush natural beauty, this 2 Star resort is a perfect setting for a romantic getaway for two or an adventure-filled escape for the whole family. Lounge around the swimming pool, walk along the sandy beach collecting the famous shells, dine in the friendly restaurants, and wonder how you can extend your holiday leave time because you will not want this vacation to end! There are also many golf courses and casinos in the immediate vicinity. 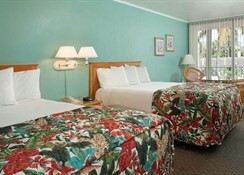 The Outrigger Beach Resort is 34 km from Southwest Florida International Airport. Local Tips: Go boating down the waterways and view a variety of wildlife such as, dolphins, blue herons, racoons and many different species of colourful birds. Food, drink and entertainment: Room Only and Self catering accommodation. 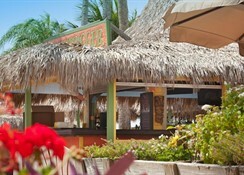 There are two restaurants onsite at the Outrigger Beach Resort Fort Myers Beach, as well as a large lounging deck, and exciting Tiki bar. Full American Breakfast Coupons are available at $13.32 per person 12 years or older, $6.66 per person 11 years or younger. Casino Dinner Cruises is just a few miles down the beach. Sports, games and activities: Swimming pool, scheduled recreational activities, fitness room/gym. Plenty of opportunities for water sports, and activities including fishing, golf, boating, kayaking, canoeing, tennis, swimming, bike riding. Additional: 24 hour reception, Concierge, laundry service, room service, safe deposit box, air conditioned in public places, wake-up service, high speed Internet, non-smoking rooms, meeting and conference rooms, banquet facilities, free parking. 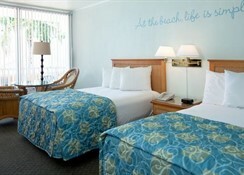 The Outrigger Beach Resort rests on the shell-laden, sugary sand of Fort Myers Beach along tranquil waters of the Gulf of Mexico.With a wide range of accommodation choices nestled in a playground of lush natural beauty, this resort is a perfect setting for a romantic getaway for two or an adventure filled escape for the whole family. Lounge around the swimming pool, walk along the sandy beach collecting the famous shells, dine in the friendly restaurants, and wonder how you can extend your holiday leave time because you will not want this vacation to end.There are also many golf courses and casinos in the immediate vicinity. Make yourself comfortable here at The Outrigger Beach Resort, Whether you choose a Standard Room, a Resort View Room with a partial Gulf view, or a Beachfront efficiency with a full kitchen, you’ll enjoy well-appointed, climate controlled spaces and thoughtful in-room amenities. 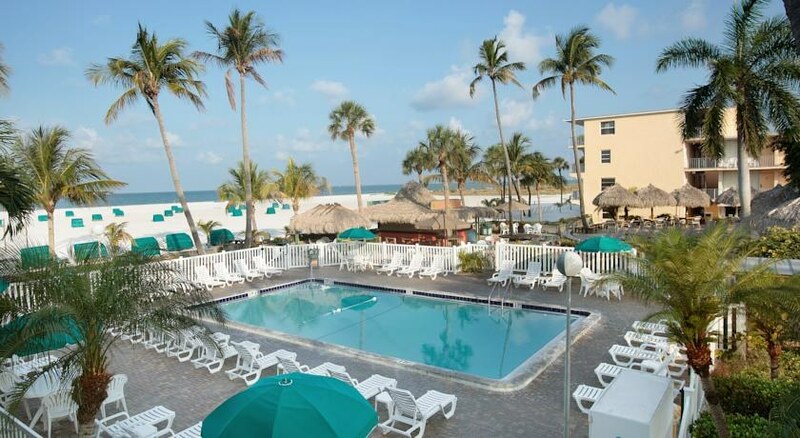 Stay connected with complimentary Wi-Fi, relax in front of your flat-screen TV, or stretch out on the comfortable bed in your Fort Myers Beach accommodations. Our hotel offers check-in at 4 pm; checkout is at noon, allowing you a little extra time to pack (or sleep in) on the day of your departure. The Outrigger Beach Resort features a range of 144 guestrooms over 4 floors with room only or self catering facilities. 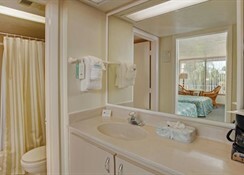 Standard rooms and Resort View East rooms can accommodate up to 4 guests and have two doubleor queen beds and a combination shower/tub unit. Room amenities include remote control TV, window air conditioner, complimentary room safe, dorm-size refrigerator and free coffee pot and daily coffee. The standard room has a view of the picnic area and Garden. Placed on the 2nd or 3rd floor, each room has unassigned under building parking on the 1st floor. Resort view rooms have views of the office and a side view of the Sundeck. There are two deck chairs outside the room on the shared walkway. Studio Rooms can accommodate 3 people and have one king bed, a fully equipped kitchen with stove, refrigerator, coffee make, microwave, toast, pans, cooking utensils and table service for 3 as well as all the amenities in Standard rooms. Beach Front Studio rooms can accommodate up to 5 people with all the above amenities and an extra remote control TV. On the private balcony or patio there are two deck chairs and one lounge chair, which offers a spectacular view of our beautiful beach and the Gulf of Mexico. The elevator reaches the 2nd or 3rd floor. There is an additional set of stairs to the 4th floor. As a guest of The Outrigger Beach Resort, you won’t have to look far to find the best dining and drinks on Fort Myers Beach. We have three options right on site for you and your family or friends to enjoy together! With salty breezes, stunning views, and inspired menus, each one creates an atmosphere ideal for casual conversation and relaxation. Head over to the Deckside Cafe for breakfast, lunch, or dinner. This bathing suit and barefoot friendly restaurant serves flavorful fare indoors and on the Sundeck. Stop by for coffee and homemade muffins, a full breakfast buffet, cheeseburgers, crunchy grouper sandwiches, award-winning Key lime pie, and delectable ice cream. 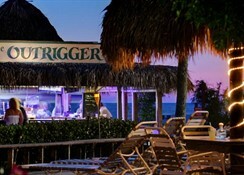 The Outrigger Beach Resort’s beachfront tiki bar is the best in Southwest Florida, and welcomes locals and guests for live music, cool tropical cocktails, and pristine Gulf views. There’s no better place to celebrate the sunset while enjoying a conch concerto. Tropical martinis, fresh caught seafood, “Best of the Beach” prime rib, hickory-basted baby back ribs, and a 55-item salad bar make Charley’s Boat House Grill one of the island’s favorite for more than 40 years. Add any one of their decadent desserts, and you have a great reason for an after dinner stroll along the beach. Within a 10-minute walk to equipment rentals and restaurants, this relaxed, beachfront resort is 18.6 miles from Fort Myers and 10.7 miles from Estero Bay Preserve State Park. Swimming pool, scheduled recreational activities, fitness room/gym. Plenty of opportunities for water sports, and activities including fishing, golf, boating, kayaking, canoeing, tennis, swimming, bike riding.